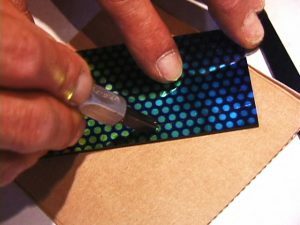 Dichroic glass sheet is cut into small pieces and a collage is designed using the different solid colors and patterns of the material. After each pendant is laid out, a small piece of clear glass is carefully placed over the top of each collage creating a sandwich of the material which will cause a 3-D optic affect when the glass is melted together. The designs are created directly on a piece of kiln shelf, so it can easily be transferred from the work area into the kiln. This allows us to make the layout, and move it into the kiln easily without disturbing the design, before the glass is fused together. Sometime we use a glass glue to hold the little pieces in place on top of a piece of black glass, if the design is complex and we do not want it to shift when moving it. Its a careful process moving all the pendants into the kiln. Once they are placed and repositioned inside the oven, the lid is closed and the kiln is ready to be fired. A computer controls the temperature and it slowly rises to 1500-degrees. Once the glass has fully fused, the kiln is turned off and the glass is then cooled to room temperature. 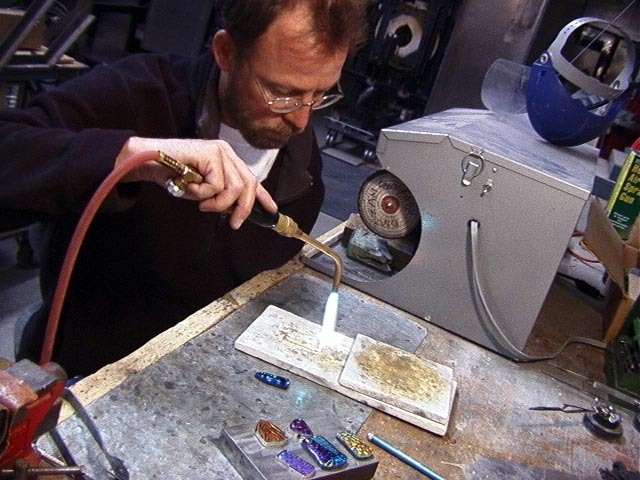 After the pieces have completely cooled, they are ground, shaped and polished, one at a time, on a glass beveling machine, creating unique geometric shapes. The pieces are then wrapped with fine silver bezel, creating a silhouette of the glass. Then each piece is removed and set aside while the fine silver is soldered onto sterling sheet. The sterling sheet is then cut to match the silhouette of the glass shape, filed, buffed and polished into its final design. When the silver work is totally completed, the glass is then permanently set in place, completing each pendant.